Roasted Beets and Rice Salad Recipe — Pip and Ebby - easy, delicious recipes! 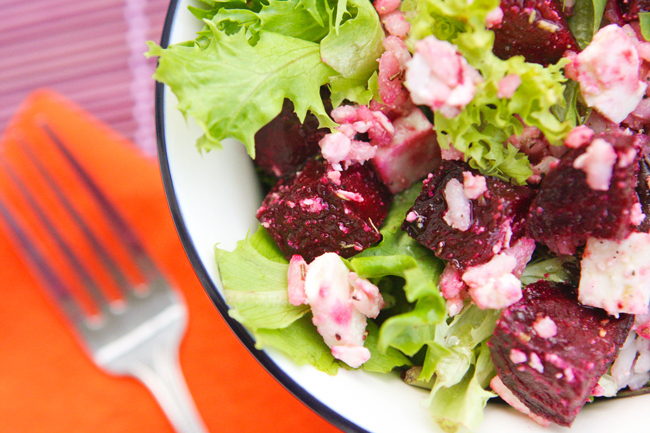 Colorful and paired perfectly with arborio rice, then topped with feta cheese, this beet salad has great texture and simple flavors. Enjoy the balsamic and rosemary combined to season these roasted beets and rice to make a great salad or side dish! How do you peel beets? Beets are easily peeled using a generic potato peeler. You can also boil the and the skin will peel off more easily. Are the leaves on the beets edible? While I haven’t tried this myself, they are edible! They are compared to a spinach leaf and can be eaten fresh or steamed too. Pickled beets are delicious! They are prepared with a cinnamon, clove and vinegar mixture. They should sit several months in the brine but are delicious once they are fully pickled! They taste very different from a cooked beet. I've acquired my first sickness of the season and it has knocked me sideways. Despite feeling like I want to do nothing but crawl into my cozy clean-sheeted bed, I had a productive weekend at home. Sunday was one of the first weekend days in months that I spent at home with no plans to leave. My boys' bedroom is now clean, all of our beds have clean sheets, my bathroom is sparkling and the laundry is done and put away. Now if only the toys could stay in one spot for more than 30 seconds!